There's only just over a week to go until we'll get an official look at the Samsung Galaxy Note 7, but today we've had an unofficial yet convincing look at the interface, including disappointing details about the iris scanner. A few days ago we heard that it might not work if you're wearing glasses or in low-light and now some screenshots shared by Android Authority seemingly confirm that. A long disclaimer also states that it may not work with certain contact lenses or for people who've had eye surgery, potentially limiting its usefulness to those with perfect vision. Even then the Note 7 will apparently need to be held steady, at face height and away from direct sunlight for the scanner to function. So it sounds like for many the feature may be more trouble than it's worth, but other aspects of the interface look more promising, with other screenshots showing off familiar features like the S Pen Air Command menu, joined by new things like the ability to film a section of the screen to create a GIF. The UI on the whole looks a lot like other recent versions of TouchWiz, but seemingly with some improvements, such as being able to automatically sort your apps alphabetically, rather than having to manually select the option every time you download something new, as was the case with the Galaxy S7. Elsewhere a Zauba import listing spotted by TechUpdate3 points to a 12MP camera with optical image stabilization, along with a 5MP front-facing camera. That sounds like exactly the same setup as the Samsung Galaxy S7, which has long been what we've expected to see. 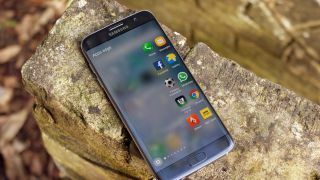 Even with a possibly disappointing iris scanner the Samsung Galaxy Note 7 looks to be an exciting phone, with other recent rumors suggesting it will have a QHD screen, up to 6GB of RAM, a powerful processor and a long-lasting battery.